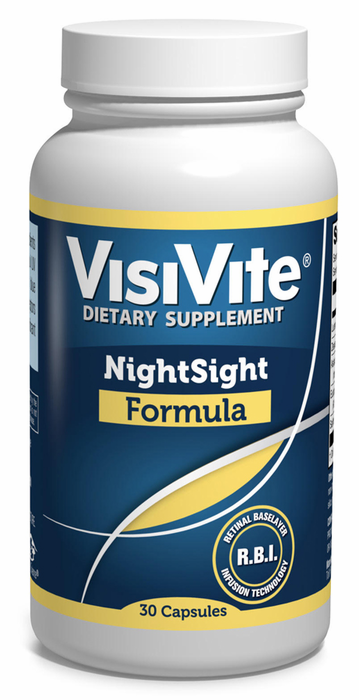 VisiVite NightSight® is a highly purified extract of nature's marigold flowers and other natural ingredients that promote high contrast and reduced glare. 20 mg Lutein, 4 mg Zeaxanthin and 1 mg Astaxanthin work to reduce blinding blue light and improve contrast. European Black Currant refreshes retinal receptors to reduce dark spots after bright headlight exposure. Saffron promotes retinal flicker speed for faster visual recovery. Dark adaptation is your ability to see in dim light after being exposed to bright light. Two classic examples are coming into a dark room after being out on the beach, or driving through a dark tunnel on a sunny day. Research from the prestigious professional journal, Ophthalmology, has shown that people with poor dark adaptation are more likely to develop macular degeneration later in life. In the office setting, there are different ways to test for it. There is a $50,000 machine called the AdaptDx, that can objectively measure dark adaptation, Or we can go more simply, instructing a patient to stare into a bright point source of light for 15 seconds and measuring the time it takes the patient to see letters on the visual acuity chart. Most patients take under 15 seconds. Patients with delayed dark adaptation can take up to 90 seconds to be able to see the letters on the screen. 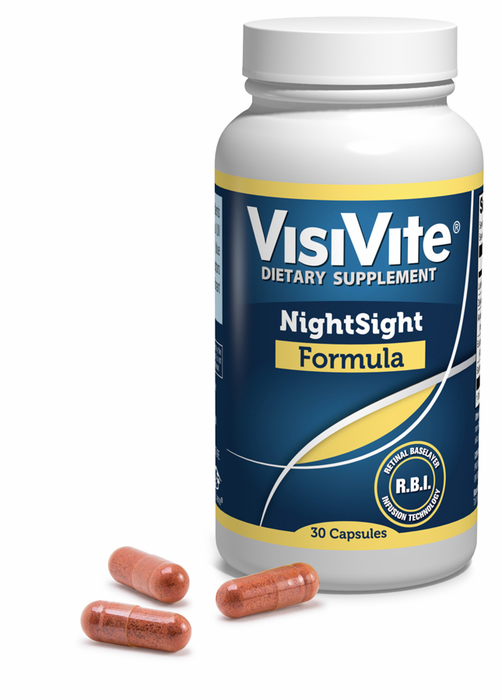 VisiVite NightSight®​ is a once-daily vegetarian capsule. 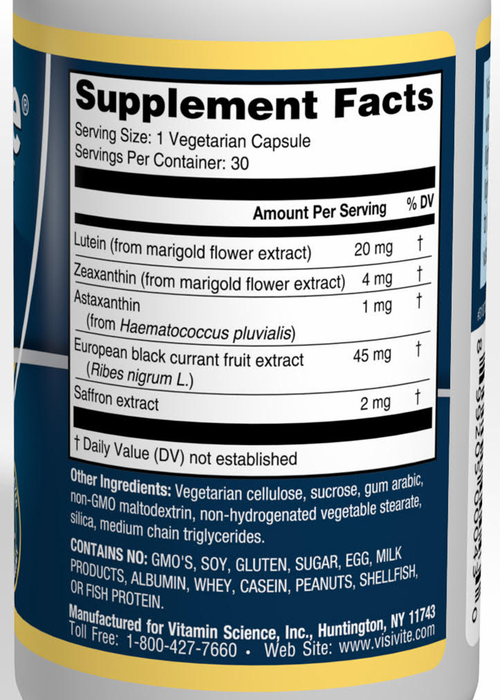 It not only contains 20 mg lutein and 4 mg zeaxanthin. It also contains C3G from European Black Currant to facilitate Rhodopsin turnover and Saffron to help with retinal flicker sensitivity. This is a nutritional supplement and is therefore required to have the following disclaimer: "These statements have not been evaluated by the Food and Drug Administration. This product is not intended to diagnose, treat, cure or prevent any disease." 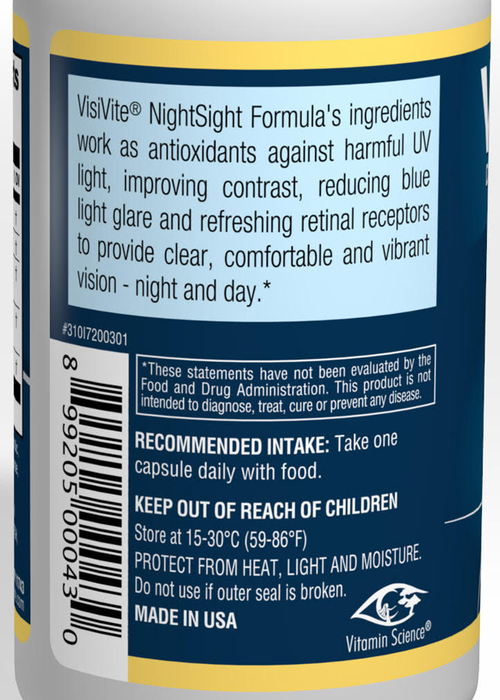 VisiVite's night vision formula, sourced from natural ingredients and provided in clear vegetarian capsules.